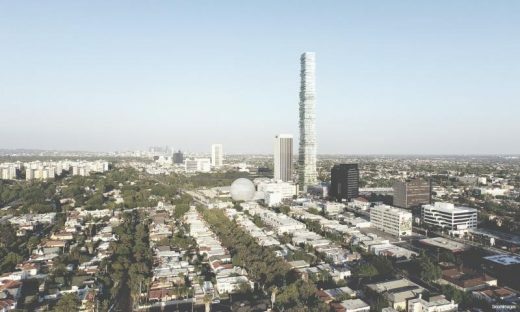 The Wilshire Tower proposal has won a 2016 American Architecture Award from the Chicago Athenaeum and European Centre for Architecture. The proposal was developed for the Architecture + Design Museum as part of Shelter, an exhibition that questioned how new forms of housing can respond to changes in the cultural fabric and physical landscape of Los Angeles. With Wilshire Tower, PAR were interested in reimagining the skyscraper for a future, denser Los Angeles and explored how individuality and nature, two qualities emblematic of Los Angeles living, could be integrated vertically in the sky. In December 2016, an exhibition of the winning projects entitled New American Architecture, opens in Athens, Greece. A catalogue will accompany the exhibition. With special thanks to BuroHappold Engineering. Architect studio based in Los Angeles, California, and New York City, NY, both USA Platform for Architecture + Research is an idea driven office, committed to intellectual and artistic rigor and recognized for architectural innovation. Established in 2003, PAR is led by partners Jennifer Marmon and Angus Goble with offices in Los Angeles and New York. PAR has received numerous awards, including the Presidential Emerging Practice Award from the American Institute of Architects Los Angeles in 2014, an International Architecture Award in 2014 and an American Institute of Architects Honor Award in 2013. The work of PAR has been featured in exhibitions at the US National Building Museum, the New York Center for Architecture, the European Center for Architecture, the Buenos Aires Architecture Biennale among others, and in publications such as DAMDI, Architect, Concept, Form and MARK. Studio addresses:- 2404 Wilshire Blvd, 9E Los Angeles, CA 90057, USA T 323-525-0990 81 Hester Street New York, NY 10002, USA T 646-807-4575 Los Angeles Architect Studio This LA architects design office is led by Jennifer Marmon, Founding Partner, with Angus Goble, Partner. Photos of buildings by this Los Angeles architecture studio welcome. November 22, 2016 in Architects.